You might not think you can get good BBQ at Disney Springs, but thanks to the opening of The Polite Pig in April 2017, you now can. I recently attended a beer and food pairing at the eatery, but they were nice enough to let me try a few other items, as well. 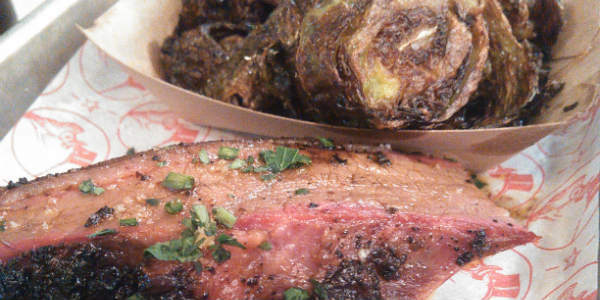 The Polite Pig is from the same people that brought you the outstanding Ravenous Pig and Cask & Larder, so I expected a quality selection of BBQ, and I wasn’t disappointed. 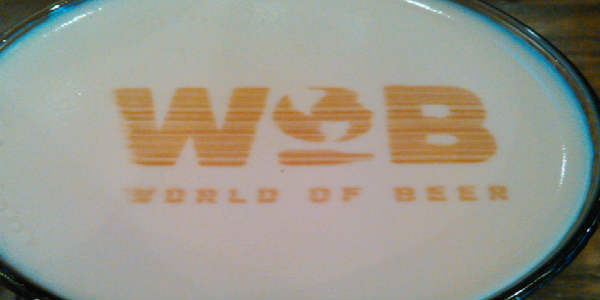 World of Beer is known for its beer selection – naturally with a name like that – but during a recent media event, I discovered their food is just as noteworthy. I joined my friend Dawn of Come See Orlando as her guest at the downtown Orlando location, and enjoyed a sampling of items from the menu, including some new items. They started us off with a German pretzel that was literally as big as our heads. Drenched in butter and salt, it was served with a stone-ground mustard and a brown ale beer cheese (normally extra, but worth the splurge), it was a great appetizer and paired well with several of the WOB beer selections. Prior to arriving at Nine Spices Hotpot, the last time I’d eaten a hotpot meal was when I was 8. 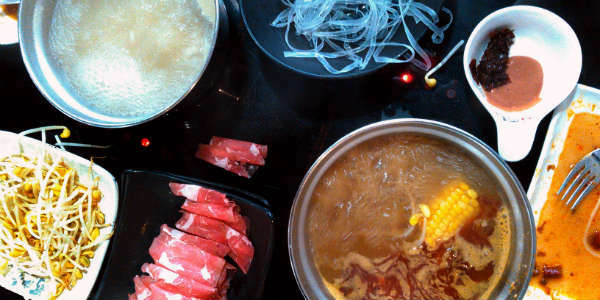 Once seated at my table, it became apparent hotpot had evolved quite a bit in the last few decades. Our table featured an induction burner for each seating…and then I noticed the conveyor belt about eye level behind my head with a never-ending parade of food. Our server was very patient and explained how their hotpot service worked. Lafayette’s Orlando is full of southern charm and good food, so when I heard they were now offering a Sunday Brunch, I grabbed Joan and we went to check it out. The restaurant is located on the 2nd Level of Pointe Orlando, in between I-Drive and Universal Blvd, next to sister eateries B.B. King’s and Itta Bena. One of my go-to comfort foods has always been the grilled cheese sandwich, which is why I was happy to hear Tom+Chee was opening their first Florida store in Lake Buena Vista. I had the chance to try a few of their menu items this week, and I have to say it takes my fave comfort food to another level. Tom+Chee first gained national exposure when they appeared on an episode of Shark Tank, but they’ve also appeared on ABC’s “The Chew,” Travel Channel’s “Man vs Food Nation,” and NBC’s “The Today Show” where they were named one of America’s best new sandwiches. Earlier this week, I joined my fellow Orlando bloggers at Marlow’s Tavern in Waterford Lakes to try them out. This location is the brand’s third in the Orlando area, and it has been open only a week. We were seated on the covered outdoor patio, which was kept cool by overhead fans with misting capabilities. Offered a choice of drinks to sample, my friend Joan chose the Grapefruit Ricky, a crisp tangy drink made with Smirnoff Vodka, fresh grapefruit and lime, and St. Germaine. She really enjoyed it. Earlier this month, I attended the grand opening media event for the new Rock & Brews Oviedo. Founded by Gene Simmons and Paul Stanley of KISS, the eatery is the first Florida location for the chain. The event started with Simmons and Stanley leading the Pledge of Allegiance with several veterans by their side, then a ribbon cutting to officially open the restaurant. This last week we were invited to check out a new restaurant opening in Dr. Phillip’s “Restaurant Row” called American Gymkhana, which offers what they call “Modern Indian” cuisine. Over an evening of drinks and passed samples, we were able to try quite a few things off the menu. We started the evening in the lounge area, dubbed Hunter’s Cocktail Lounge. A short menu of signature mixed drinks were listed, along with a few wine and beer choices. Based on the bartender’s recommendation, I opted to try the Adraki Punch, a citrusy punch featuring fig-infused vodka, homemade honey-ginger syrup, and a mix of lemon and grapefruit juices. It was tangy, with a hint of sweetness, and I felt it paired well with the food samples. We were also offered champagne while we ate. Our tour guide for this journey, Mitchell’s Fish Market General Manager George Grigor, introduced each dish and told us about its preparation and ingredients, making sure that any food allergies were addressed. The question “anyone allergic to bacon?” was met with a collective gasp through the room! The wines were expertly presented by E&J Gallo Winery Field Marketing Manager, Daniel Rowland, who also provided a beautiful slide show of winery landscapes which transported us on our imaginary travels around Italy. Trio of Crostini topped with Fresh Tomato Bruschetta, Olive Tapenade and Lobster. Photo by Christina Thomas. Earlier this week, I was invited to join several other bloggers to learn more about Papa Murphy’s pizza stores. The company is different from others in that their products are take-and-bake, meaning they prepare the pizza instore, but you cook the pizza yourself at home. So the big question is why would somebody take-and-bake when they can just call up and have a pizza delivered, already cooked. The answers we found were freshness and customizability. The cooler, mixer/chopper, and dough hopper at Papa Murphy’s. Papa Murphy’s locations do not have freezers. Nothing is shipped or stored frozen. They make the pizza dough in store from scratch, as we witnessed yesterday morning. They also cut and shred all the toppings in store as well. This means everything that goes on your pizza is fresh, and that is something you can really taste in the final product. Earlier this week, I participated in a dinner with many of my fellow Central Florida bloggers, and during it, we got to sample some of the new menu items at Tony Roma’s restaurants. We started with Cranberry Romaritas, a signature margarita, while waiting for everyone to arrive. There was also an option to sample Sam Adam’s Octoberfest beer, which would feature as an ingredient in one of the menu items we were to try later. The brought out three appetizers for us to try. The first was called Screaming Cheese. I grew up on fried cheese (curds, mozzarella, etc), and Tony Roma’s version didn’t disappoint. It had slightly spicy cream cheese inside, so it was creamy soft inside and crispy outside from being fried, and plated with marinara sauce. Very tasty. Next up was Buffalo Chicken Egg Rolls with Goat Cheese sauce. If you like Buffalo chicken wings, you’ll enjoy this variation. Inside the fried wonton wrappers was a spicy chicken mixture, with crumbles of bleu cheese on top. 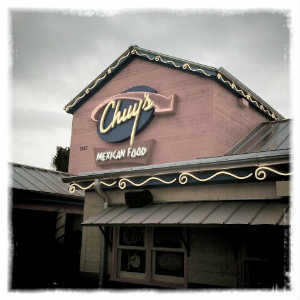 One of the newest restaurants to hit the Orlando area is Chuy’s Tex-Mex – so new in fact, that they officially open to the public today (March 19, 2013). But last night, we were invited to try out the restaurant, and we went in with empty stomachs, and hopes that this place would be good. We left satisfied on both counts. 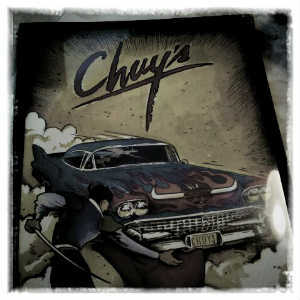 Chuy’s is based in Texas and has slowly been expanding across the U.S., developing a cult following among foodies. This is their second Florida location. We arrived 15 minutes early for our reservation time, which is good since the parking lot was full. So full that we had to park in back of the neighboring restaurant. Once inside we got the scenic tour to our booth, and noticed that the restaurant was separated into different rooms, each with a slightly different decor. I’m not sure of the name of our room, but the entire ceiling was covered in car hubcaps. En route, we passed by the tortilla-making station, thereby assuring us that they were indeed fresh-made. We had no sooner sat down than a server dropped off some chips and salsa. The salsa had a bright fresh taste and thankfully didn’t have that smokey taste that a lot of Tex-Mex places have. We ordered a bowl of the chili con queso to go with the chips, and it was very tasty, with a slight heat to it, but still mild enough for those who don’t like spicy food. There were three of us, so we all ordered different entrees, and sampled amongst each other’s dishes. One of my friends ordered the Fajita Beef “Big As Yo’ Face” Burrito, which came with Mexican rice and refried beans. The other ordered a combo Fajita meal with a mix of steak and chicken. It came with a bounty of toppings and sides (everything from guacamole and pico de gallo to refried beans and Mexican rice), but the kitchen messed up and left off the chicken. Since the restaurant was busy, she opted to eat the dish as served. Chuy’s marinates their Fajita steak in a signature blend of Shiner’s Bock beer, serrano peppers, lime juice and a mix of secret spices, for 24 hours before grilling. This results in a very tender and flavorful steak that served as a great base for both of my friend’s meals. I even liked it, and I’m not much of a steak fan. I opted for the Chuychanga, a chimichanga dish made with oven-roasted chicken, cheese, cilantro and green chiles, deep-fried in a flour tortilla. I had mine covered in queso. For sides I went with the green chile rice and charro beans. Everything had just the right amount of spice and flavor to make my taste buds happy. 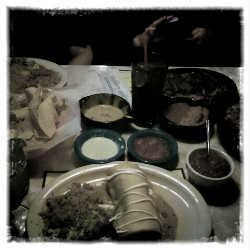 Most entrees are in the $9-$12 range, with Fajitas and some Combo platters slightly more. You do get a lot of food for the price – all three of us took home leftovers. One of Chuy’s unique offerings is a selection of sauces that you can get on your entrees. 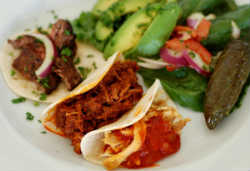 They range from mild Tomatillo and Ranchero sauces to spicy Green Chile and Hatch Green Chile sauces. Our server kindly obliged when I asked to sample all of the sauces, and soon we were taste-testing them all with the chips. We all liked the Creamy Jalapeno (like a spicy ranch dressing) and Hatch Green Chile, as well as the restaurant’s signature Boom-Boom sauce, which tasted like a mixture of the Green Chile and Queso sauces. I did try the house margarita, as all alcohol proceeds last night were donated to the Give Kids the World charity. Unlike some restaurant house offerings, Chuy’s was not shy about the tequila portion, and the bartender accommodated my light salt on the rim request. Overall, the meal was excellent, and I look forward to returning and trying out other items off the menu. I have to also make mention of the terrific service. Our server, Jake, was quick, efficient, and friendly, even though the place was packed. He also went out of his way to accommodate our requests. There were a few glitches, such as the Fajita mix-up, but since the place was still technically in training mode. we gave them a bit of leeway. Chuy’s Tex-Mex opens to the public today (March 19) at 11am. It is located at 7913 W. Irlo Bronson Memorial Hwy in Kissimmee (west of I-4, next to Joe’s Crab Shack). Their phone is 407-787-3545 and you can follow them at the Chuy’s Orlando Facebook page. We’ve eaten at quite a few restaurants over the past year, and written about a lot of openings and closings. While I’m working hard to bring you news and reviews of things happening around Orlando and its surroundings, there are some other great blogs out there who are doing the same. So here are some recent posts that you might enjoy reading. 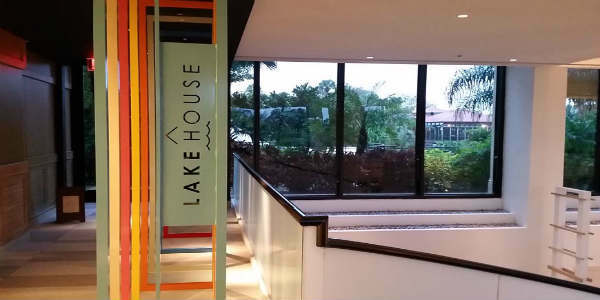 The Pulse of Central Florida checked out the new Brick House Tavern + Tap on I-Drive. Seems if you like Hooters and Winghouse, you’ll like this place. I like their beer menu – some really good stuff there. What do you do after being trapped in a mine for several months? According to Attractions Magazine, if you’re the Chilean miners, you go to Walt Disney World. Speaking of WDW, The Disney Food Blog, has a guest review of the Spirit of Aloha Luau Dinner Show at Disney’s Polynesian Resort. Lots of photos, too. Looking for Things to do in Orlando with Holiday Guests? Central Florida Top 5 has a huge list to get you started. Tasty Chomps food blog reviews Hamburger Mary downtown. They have some of the best burgers in town. Show’s not bad either. AMPlified Culture reviews the College Park location of Infusion Tea. I like their menu, too. Finally, after all of the eating done over the holidays, how about working it off at a roller derby boot camp? The Daily City has all the info you need.